Take your FURRY FRENZIES fun on tour with this two-in-one tour bus and performance stage playset! Help your adorable star sit on top of the tour bus to watch the show and then get in on the action by spinning on stage. When it’s time to move on to the next gig, put your friend inside so he can zoom around and ride to the next big performance! 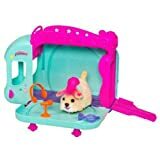 Two-in-one playset is both a tour bus and a performance stage for your FURRY FRENZIES figure to spin around and rock out on. Playset comes with PAWS McROCKIN’ figure and 5 accessories.